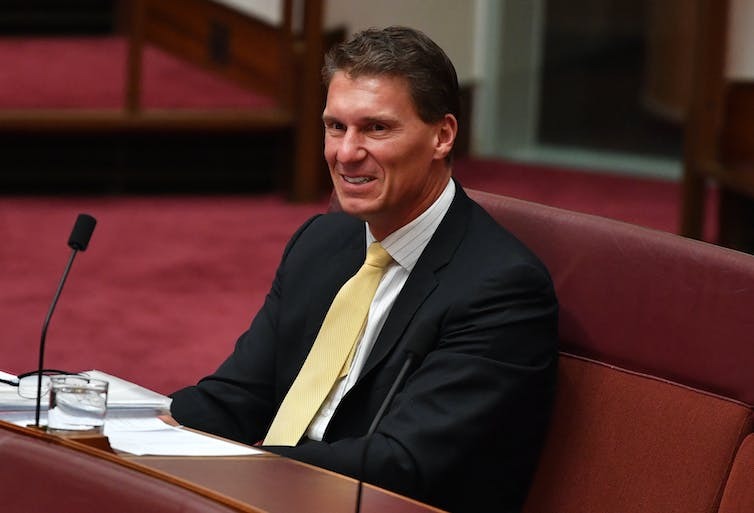 Cory Bernardi was recently caught up in a dispute over whether he had correctly disclosed a property he owns. Parliamentary rules require MPs declare a broad range of interests. They must also declare interests they are “aware” are held by their spouses and dependant children. Politicians file interests late – sometimes only after media exposure. They frequently disregard the rules relating to minor assets and defy the rule relating to reporting spousal assets. The requirement of awareness in relation to family assets makes ignorance an easily available defence. However, the chief problem is enforcement. The relevant law says events occurring within parliament, which would include breaches of financial disclosure rules, cannot be judged by the courts. This rule is important because it protects free debate. But it ultimately makes the enforcement of internal parliamentary rules subject to political forces rather than purely legal considerations. This is because of how parliament’s internal processes work. The initial decision on whether an MP has acted in contempt of parliament – for example, by failing to declare assets – is made by the relevant house’s privileges committee. The government has a majority on the House of Representatives committee, so there is obviously little chance it will find against one of its own MPs. And even if a committee does make an adverse finding, it amounts only to a recommendation. It is up to the entire house (in which, again, the government has a majority) to make the final decision as to whether contempt has occurred and, if so, what punishment to impose. Where an opposition MP is under the spotlight, a finding of contempt is theoretically more likely. But the reason this is only theoretical is that a party with a majority is aware the time will come when it will lose that majority. For this reason, it will not want to establish a precedent that can later be used against it. So, it is in the interests of both major parties not to pursue contempt matters too vigorously. This was strikingly illustrated in 2002, when former defence minister Peter Reith refused to appear before a Senate committee investigating the “children overboard” affair. On the face of it this amounted to contempt. Also, the Coalition parties did not hold a Senate majority. But Labor refrained from compelling Reith to give evidence or face contempt proceedings. The upshot is there is no real likelihood MPs will face punishment for breaching financial disclosure rules. All that happens is they are allowed to “correct the record” – which makes failure to disclose essentially risk-free. Contrast this with the requirements imposed on directors of public companies. If any “related party” of a company – including a director, their spouse, child, parent or other company that any of these parties controls – wants to enter into a transaction with the director’s company, the shareholders’ permission has to be obtained in advance. So, for example, if the father of a director wanted to purchase a vehicle owned by the company of which she was a director, the shareholders would have to approve the transaction before it took place. Most importantly, any person involved in a breach of the rules is subject to a civil penalty of up to A$200,000 if the breach is not dishonest (that is, if it is unintentional), and faces criminal prosecution and a fine of up to A$200,000 and/or imprisonment for five years if the breach is intentional. The consequences of MPs breaching financial disclosure rules could easily be toughened by amending the relevant law. Breaches should be subject to normal court proceedings, rather than being left to parliament’s dubious procedures. There should also be a penalty regime mirroring that applicable to company directors.